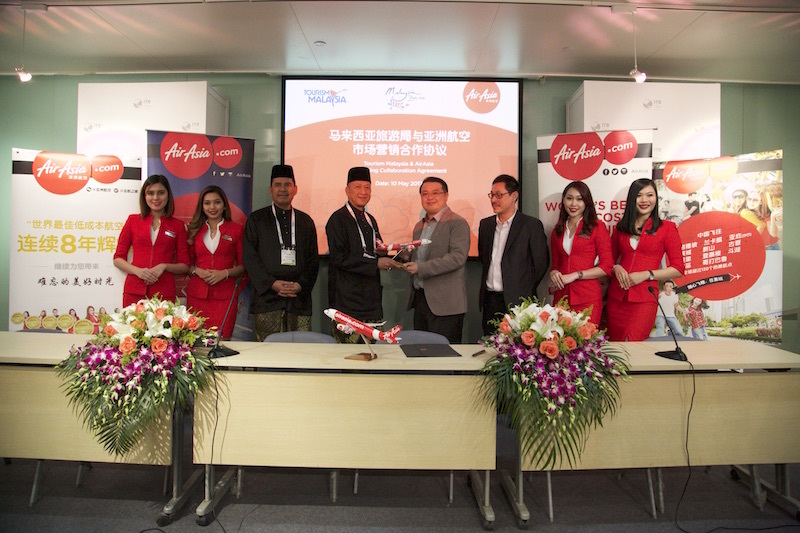 Tourism Malaysia and AirAsia, the world's best low-cost airline signed a Memorandum of Agreement which will see both parties collaborate to promote tourism in Malaysia. The signing ceremony was held between Dato' Sri Abdul Khani Daud, Deputy Director General (Promotion), Tourism Malaysia and Spencer Lee, Head of Commercial for AirAsia Berhad, and witnessed by Dato' Seri Mohamed Nazri bin Abdul Aziz, Minister of Tourism & Culture Malaysia. Dato' Seri Nazri was in Shanghai to lead Malaysia's participation at the inaugural ITB China event at the Shanghai World Expo Exhibition and Convention Centre. The two-year agreement between Tourism Malaysia and AirAsia will include efforts in terms of brand ads, promotional activities and campaigns; familiarisation trip for consumer, trade, media, travel agencies to Malaysia; synergy in planning between tourism development and air transportation to provide better connectivity; market intelligence sharing and assistance for the development of Tourism Sector; joint roadshows between both parties to market Malaysia to trade partners; and many more. Tourism Malaysia and AirAsia will focus on developing promotional activities to promote Malaysia to all of 10 Asean countries, China, Japan, Korea, Sri Lanka, India, Bangladesh, Maldives, Nepal, Saudi Arabia, Iran, Australia and New Zealand. In conjunction with this partnership, AirAsia is offering 5% special discount on top of all existing promotions exclusively for UnionPay Cardholders. This discount is available for booking starting now until 4 July 2017, with travel period from 5 May 2017 to 5 June 2018. Visit airasia.com or use the AirAsia mobile app on iPhone or Android devices to book this special discount.